Another day and more criminal acts against Jessica Coco is the word in the HHA with the latest attacks coming simultaneously on both her home and car. Last Thursday, a break-in and robbery at Coco's lower Jackson Street apartment in the HHA left her more upset than similar incidents previous as items of sentimental value were taken. Coco is an activist within the HHA who voiced skepticism then opposition to the controversial undocumented massive redevelopment plan downtown proposed by HHA Executive Developer Carmelo Garcia called Vision 20/20. No Master Plan has ever been presented to the public. A police report has been filed recording family jewelry stolen, valued at $5,000. Her car was simultaneously vandalized but in a limited way Coco said, once again sending a "message." The word on the street says the targeting is part of a scheme to further direct hostility and worse to the disabled woman who suffers from a pulmonary condition. "This is intolerable," Coco said and pointed to HHA Executive Director Carmelo Garcia encouraging the continued criminal actions against her. Garcia however has denied ANY criminality has occurred against Coco in ALL the previous incidents, even as numerous police reports were filed. Coco said the rumors being circulated inside the HHA about her are that she is a "pawn" of the mayor and is "hoping" to tear down the projects on the mayor's behalf. "It wasn't enough to threaten to shoot me," Coco said before adding that people in the HHA are saying Garcia "plans to make my life miserable for the rest of my life," or until he "forces me to get out, even if he's not here," as HHA Executive Director. Beth Mason could not be reached for comment. Carmelo Garcia who also is an Assemblyman under State Senator Brian Stack's tutelage is reportedly away on vacation. He typically responds to a written question seeking comment threatening to file harassment charges. 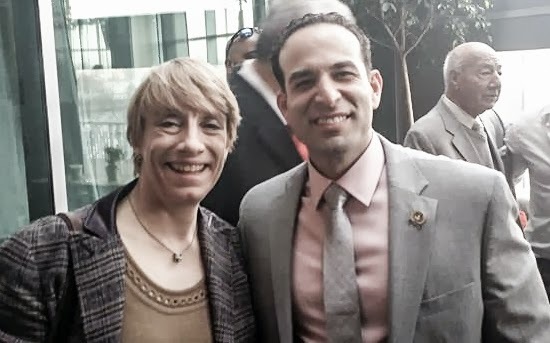 Councilwoman Beth Mason and HHA Executive Director Carmelo Garcia at his fundraiser earlier this year are both allies in the undocumented massive redevelopment he's proposed called Vision 20/20. Neither has much to say about the continued abuse and criminality HHA resident Jessica Coco has suffered including last Thursday. Coco has publicly opposed Vision 20/20 and once identified has been the target of crimes on a regular basis inside the HHA at her lower Jackson St. apartment. Talking Ed Note: Another clash with Garcia and the HHA Board of Commissioners in a week ending report HHA employees could not be paid because the new Chair had not been properly set up on the agency's bank account. Garcia, who regularly cultivates media publicity promoting himself would not comment on his role in the matter. Chairwoman Dana Wefer was sitting on a pile of checks awaiting her signature as Garcia refused to respond for a week on the issue in the latest blatant act of insubordination. At the last HHA meeting, Garcia attempted to assume the role of the HHA Chair and obtain her signatory authority using a facsimile of her signature. He left before that proposed resolution was tabled claiming illness.